Setting up of a new system can be cumbersome when it involves a lot of staff, departments, different working hours and conditions, and other variables. In view of this, FingerTec has created a wizard that can migrate database from TCMSv2 into Ingress without any hitch. This process will definitely simplify system admin work because they don’t need to set up Ingress from scratch. This Migration wizard in Ingress will ease the admin’s job and give them the flexibility to either keep the existing data such as User, Devices, Schedules & Rosters, Leaves & Holidays, etc, or replace it with the data from TCMSv2. Important note : Kindly make sure to use the latest version software of TCMSv2 (v2.2.027) and Ingress to enable a successful migration process! Get latest version of TCMSv2 and Ingress software here. The screenshot below shows the data that has been downloaded into TCMSv2 on 13th October 2015, causing the Ingress software to only have data up to 12th October 2015. 1. Backup the database for both TCMSv2 Software and Ingress Software. 3. Un-tick "I want to replace FingerTec TCMSv2 data to existing FingerTec Ingress” > Select all users > Click "Import Selected" to proceed with data migration. 4. 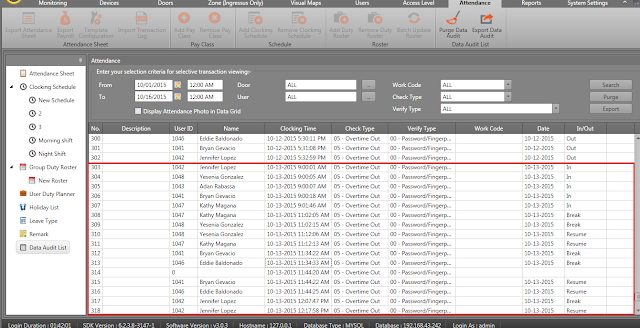 After the migration process is completed, click on the Attendance tab > Data Audit List and you can check that the clocking data on 13/10/2015 has been successfully migrated from TCMSv2 into Ingress without replacing the existing data in Ingress. 5. 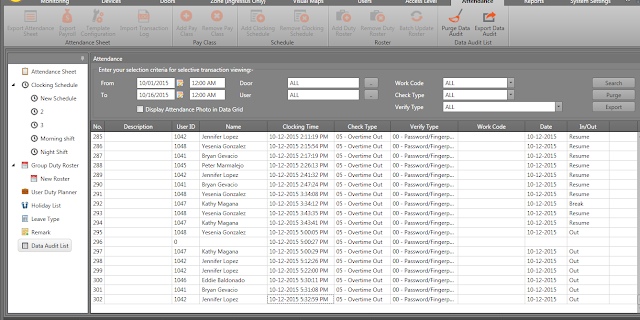 Re-generate the attendance sheet for all users and the attendance sheet is complete without any missing data. 1. Please ensure you activate your device in Ingress so that you will have full access to all tabs. Before activating any device, only these selected tabs: System Settings, Users and Devices are accessible. Doors, Access Levels, Monitoring, Attendance and Reports are initially disabled. 2. Go to Devices, select the device > click Activate Device. System will automatically activate the old device with the Ingress software through online activation. 4. TCMS V2’s and Ingress’s license keys are different, so you will not be able to use the previous activation key. 5. It is advisable for users to disconnect device from TCMS v2 once you successfully migrate database and connect device to Ingress software. Once you have downloaded data into TCMS v2 software, it will automatically delete transaction data from the device and you will not be able to download that data into Ingress. 6. If you are testing attendance and reports after the migration, firstly, please generate attendance for all users to ensure relevant data enters the attendance sheet (Attendance > Attendance Sheet > Generate > Select User ID and Date range> Ok). Also, check user Issuance Date and ensure that it is prior to the date selected for generating attendance. I can't migrat tcms with ingress.. I can't see the users"""